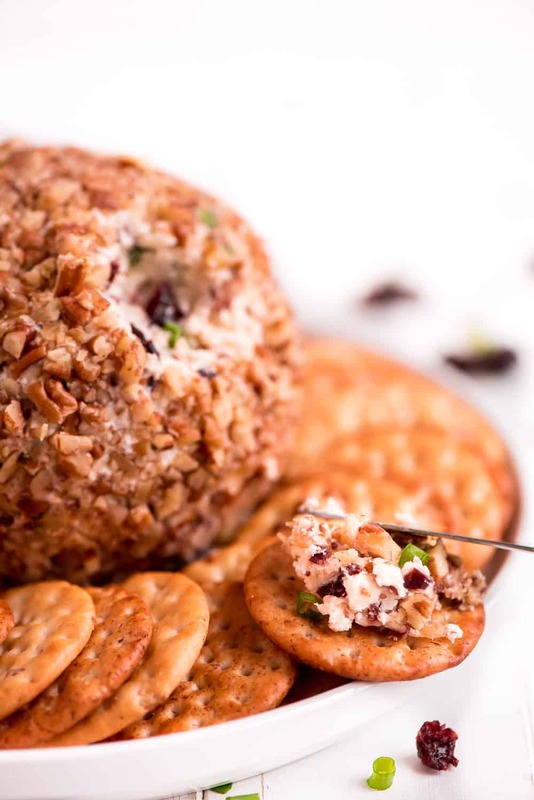 This Cranberry Pecan Cheese Ball is the easiest crowd-pleasing appetizer to share with your family and friends this holiday season. Cheese Balls are always the hit of the party! 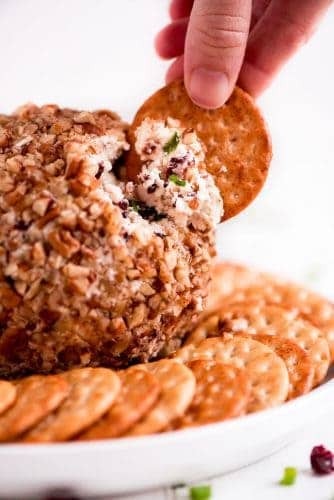 You will also love this Bacon Ranch Cheese Ball, Jalapeno Bacon Cheese Ball, or even this Pineapple Cheese Ball! Hello again! 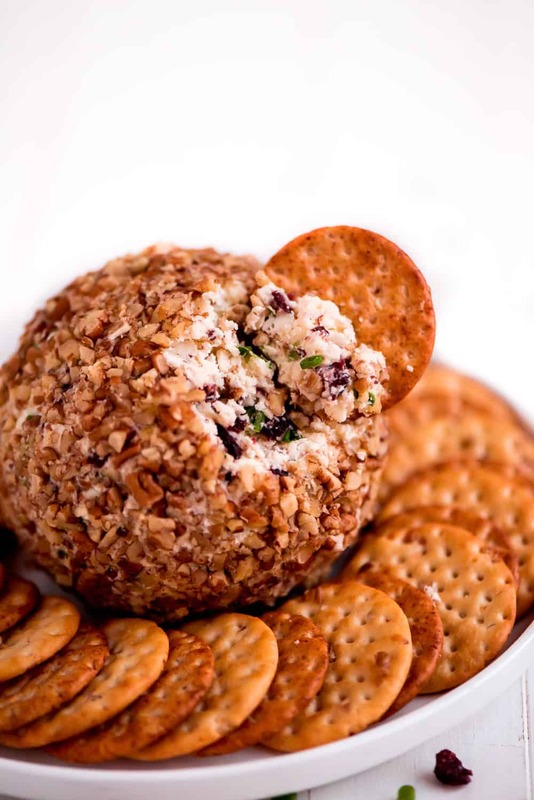 Melanie here from Garnish & Glaze bringing you a super easy appetizer- Cranberry Pecan Cheese Ball. If you are a fan of cream cheese appetizer dips like Jalapeno Popper Dip and Crab Rangoon Dip then you are going to love this cheese ball. 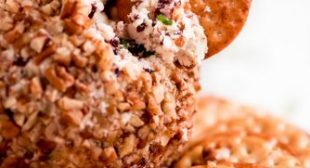 Grab a box of crackers and five simple ingredients (cream cheese, white cheddar cheese, dried cranberries, green onions, and pecans) and you’re good to go! Don’t be fooled. Just because this cheese ball is easy to throw together and requires only 5 ingredients, it is packed full of flavor. 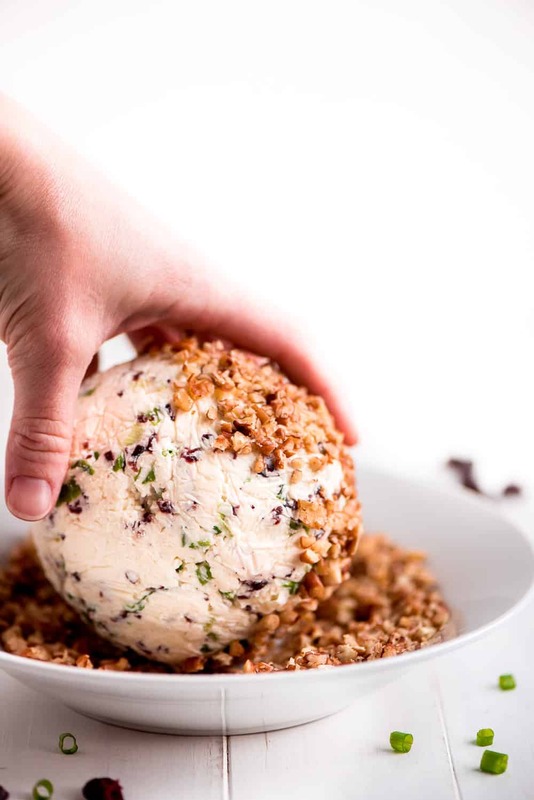 The sharp white cheddar cheese combined with the green onions gives it a strong flavor punch that is deliciously contrasted by the sweetness of the dried cranberries and finished off with the crunchy nuttiness of the pecans. After you take your first bite you won’t be able to stop going back in for more! I’m not gonna lie, I almost always eat 2 servings. The first step is to start with some softened cream cheese and mix it with sharp white cheddar cheese. Mix in your finely chopped cranberries and green onions until evenly combined. Next, you need to shape the cheese into a ball. The best way to do this is to place the mixture onto a large piece of plastic wrap and wrap it all up. Give it a few rolls on the counter, pressing and forming it into a ball and then let it chill in the fridge for at least an hour but up to 3 days. Honestly, I prefer making it at least a day ahead. This allows the flavors of the onion and cranberry to really merry with the cheese. My mouth is watering just thinking about how yummy it is! You can roll the cheese ball in nuts well ahead of time but if you want them to remain firm and crunchy, I recommend waiting to roll the ball in the pecans. Just place the nuts in a bowl and press all sides (except the bottom) of the cheese ball in the nuts. Place the ball of cheese on a plate, gently pressing the ball down with a little twist so that it will stay on the plate and not slip away while people are digging away at it. Place a variety of crackers around the ball and serve. 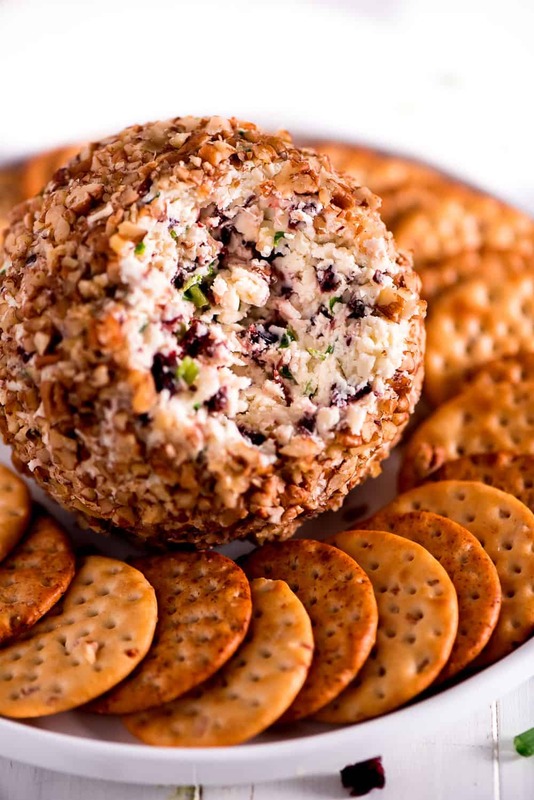 Unless someone is allergic or lactose intolerant, they are not going to be able to pass up this yummy Cranberry Pecan Cheese Ball. Enjoy! Mix cream cheese and cheddar cheese together. Fold in the cranberries and green onions. Drop cheese mixture onto plastic wrap and fold up. Roll into a ball and place in fridge for at least an hour. Just before serving, roll in the pecans. Serve with crackers.